First, I believe this has less to do with the nature of the Passion itself than our own inability to handle ourselves in the face of suffering and death; it is a spiritual lacuna that needs to be dealt with accordingly. Furthermore, nothing in the life of Jesus would make any sense whatsoever without the Passion. If we fail to come to terms with its significance, we fail to understand the mission of Jesus. This brings us to my second point: some see this devotional practice as merely about appropriating factual knowledge about the Passion. They say, “I have heard the account at Good Friday services ever since I was little; I have read commentaries on it. I get it. What more needs to be said? What more needs to be learned?” Similarly, some see the Passion story as a recollection of a past event: yes, so it happened; what's next? While the Passion and Resurrection did take place in history, we can and should go beyond seeing it in its mere historicity. This is where St. Ignatius of Loyola comes to the rescue. In the Spiritual Exercises, St. Ignatius recommends that we pray with the life of Jesus by using our imagination to place ourselves into the scenes of the Gospel. This is more commonly known as “Ignatian contemplation”. With this practice, we are no longer dealing with words and ideas; we are presented with a personal encounter with Jesus, sometimes without any scripted dialogue. Knowing about someone is one thing; knowing someone personally is quite another. 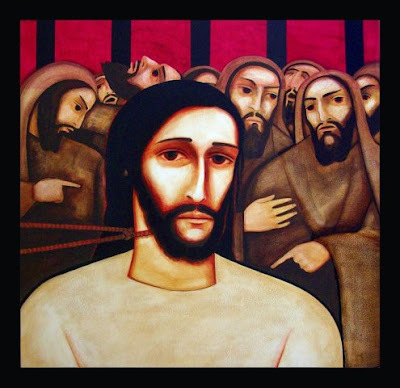 In the Way of the Cross, we can imagine ourselves helplessly looking on as Jesus is being unfairly judged and condemned, or see ourselves urgently trying to follow Jesus' way to Calvary. In fact, this way of utilizing our imagination goes well with the tradition of the devotion: it is said to have begun as a practice of the pilgrims in the Holy Land to visit the different sites of his Passion. You are in the Garden of Gethsemane where Jesus sweated blood – now imagine yourself there, with Jesus. What is stirring within you? What do you want to say to Jesus? This teaches us to be with Jesus in his suffering in a more tangible and personal way. One word on praying the Way of the Cross in an Ignatian fashion: this method takes time, and it is different from going over all fourteen stations in the span of thirty minutes. Therefore, it would be prudent to allot more time to each station and pray with a few each day rather than rushing through all of them. I hope that this method offers a different perspective on this devotion and perhaps something new to try as we enter Holy Week. Finally, while deriving spiritual benefit from the Way of the Cross is good, we should bear in mind that this prepares us to see and have the courage to accompany the suffering Jesus in the abandoned and neglected of this world.